Support your loved one with this great Personalized Epilepsy Awareness Sweatshirt, whether it’s your Child, Grandchild, Sister, Brother, Friend or any loved one you know battling with Epilepsy. With any Epilepsy Awareness Walk Event, you along with family and friends can show your support and help raise awareness together. Our Personalized Epilepsy Awareness Sweatshirt is available on our premium 50/50 cotton/poly blended sweatshirt, machine washable in youth sizes XS-L and adult sizes S-3XL. Includes FREE Personalization! 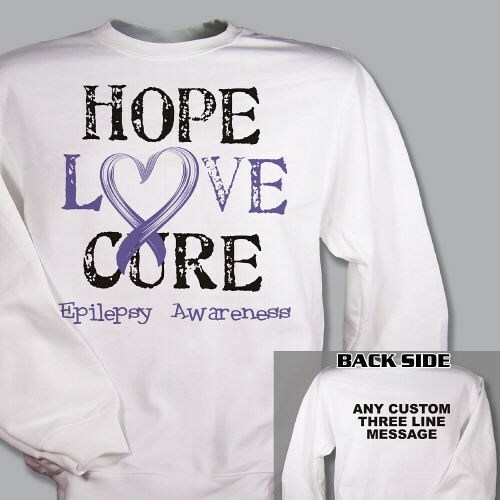 Personalized your Epilepsy Awareness Sweatshirt with any three line custom message on the back.